Hi I'm Anne-Marie, I am licensed by the DVSA to give driving tuition and I am passionate about road safety and people. I became a driving instructor because the parts of my previous jobs that I really enjoyed were helping people to achieve their ambitions and their is nothing like the feeling of helping someone to pass their driving test first time. Previous work colleagues who know me very well, were not surprised that I was going to be a Driving Instructor and said its the perfect job for me. Putting people at ease by being calm and friendly is very important to me as I know how crucial it is to feel comfortable and relaxed when learning to drive. Fortunately, I have been trained by LDC in the latest adult coaching and training techniques, so you can be assured the training I give will be of the highest standard. 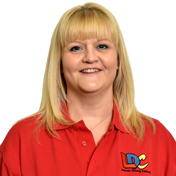 I chose to work with LDC because everybody is different and the LD System allows for flexibility in lessons, so that you learn to drive safely at a rate that suits you. I aim to make every lesson enjoyable and as productive as possible. The LD System just helps me to do this more effectively. I hope this has given you a brief idea about me, so please feel free to click here to "Contact me"